“Wake up, Matt, wake up,” an insistent voice repeats in my head. From that moment, Matt McGregor’s life will never be the same. Upon awaking from cold sleep, Matt, co-captain of the space freighter, HC7 McGregor-15, discovers the ship has been abandoned and life support is failing. 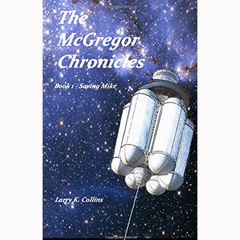 Once he gets the systems started, he finds out his brother and co-captain, Mike, has been captured by space pirates. Matt immediately sets out to rescue Mike, aided by the disembodied voices. He is reluctantly paired with Federation Lieutenant Tracy Warren. How will they find Mike and save him? Can they work together, despite their differences? Will they survive the rescue attempt? And who are those voices in Matt’s head?